Doctor Who: Ten Best Moments From THE HUSBANDS OF RIVER SONG | Warped Factor - Words in the Key of Geek. Three viewings and copious amounts of sherry later, I am finally ready to sit down and come up with a list of the best moments from this years Christmas special. And right off the bat I must say how stupid this episode was, but how brilliantly so! This was everything a Christmas special should be; fun, over the top and loud but with a touch of melancholy amid all of the frolicsome nonsense - and I use the word nonsense in a very good way! These aren’t really in any sort of order to be honest. I love the title sequence used for Peter Capaldi’s run as the Doctor. I think they’re the most unique since the original and I love it when the graphics team at BBC Wales have a little play with them like adding Clara’s eyes and moving Jenna’s name above Peter’s for Death in Heaven and then giving them a Christmas make over for Last Christmas. I probably only like it so much because it often gets a sour reaction from a lot of fans! I was glad to see the titles retain the same elements from the ones used in Last Christmas along with new snowy transitions, baubles replacing planets and finally seeing Alex Kingston receive the above title billing she deserves! 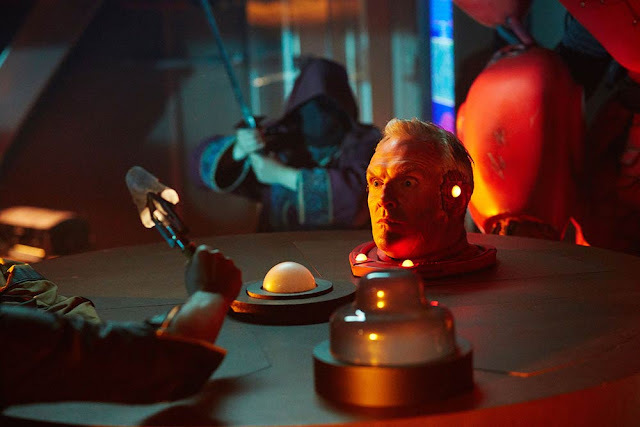 There certainly wasn’t enough of Davies in this episode but he was great in what we saw of him. As one of my favourite comedians it was a delight to see him in the show! I’m surprised it has taken so long for Lucas to appear in the show. He added some great comedy to the episode although like Davies, he was unfortunately underused. This one has received quite a mixed reaction but I think it’s absolutely perfect. Steven Moffat said he wrote this episode as if it was his last and despite being a big fan of his, I kind of wish it was his last because this one line wrapped up his era pretty nicely I think. 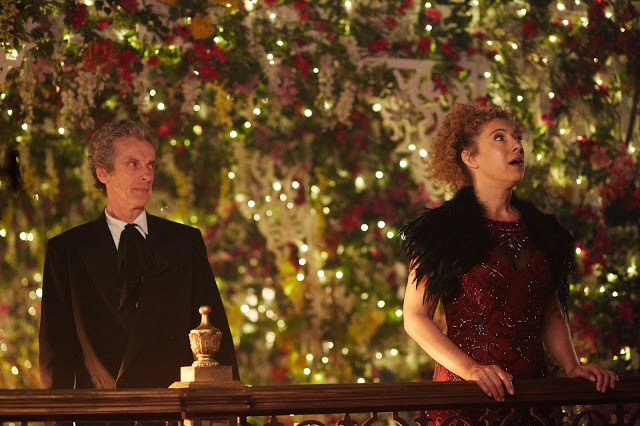 Not only did it wrap up River and the Doctor’s story and allow for a fresh start under a new showrunner, it would have been a fitting closure to Moffat’s fairy tale era of the show. 6. It’s Bigger on the Inside! Peter pretending to not be the Doctor was fantastic and this was one of the highlights. After 2000 years the Doctor must be pleased to finally have his own go at reacting to the TARDIS’ interior and to do it properly. We also got some more of the Doctor’s apparent incompetence towards flying the TARDIS and how River is better which is always fun to watch. I loved seeing what River gets up to when the Doctor isn’t around, from her confessing to having stolen the TARDIS multiple times and much to the Doctor’s surprise her inclusion of a drinks cabinet in one of the roundels. So that’s what they’re for! This scene might be my second favourite of the episode (after the Towers of course). It’s just… I don’t really have words for it. Alex Kingston is such a brilliant actress and her rant about loving the Doctor was beautifully delivered and wonderfully written. Hats off to Capaldi here too because that man is a phenomenal actor! He has such an expressive face, and even when it was solemn like in this scene he was able to convey so much emotion - it’s almost like he actually does love River and was saddened to see that River believes he does not and to have that ultimately confirmed. Together with Alex it was an emotion overload. Champagne casting! Once again Murray has produced an excellent score for the episode with a particular highlight being the soundtrack used at the Singing Towers as well as the incorporation of old tracks such as The Sad Man With a Box, The Enigma of River Song and The Doctor’s Theme which has made it’s return this year after such a long time. This piece of music brings me nicely on to number 3. I SHIP IT! There, I said it. As I mentioned above, Peter and Alex are amazing together. Need I say anymore? They really are perfect together. If it meant spoiling the ending of this episode I’d gladly watch them both for a whole series! Whenever (in the far far future) Peter hands over his TARDIS key and goes on to do Big Finish Audios, I’d like a series set during their 24 years on Darillium. So yeah, I love the pair of them. Absolutely perfect! So there we have it, that’s it for Doctor Who on TV in 2015. Next year we have the highly anticipated (sarcasm is difficult to put across in text… STOP IT! Don’t pre judge) Class airing in the Autumn and possibly Series 10 which will be airing at um some point in the future. So I’ll hopefully be back with more top 10 best moments then. What did you think of The Husbands of River Song? Let me know down below.